When learning about being a good neighbor, one of the best places to turn is Sesame Street. Generations have grown up learning how to read, count, and make new friends from their friendly neighborhood Muppets. Sunny Days! pays tribute to this community of characters and their impact on our families. This bright, whimsical kit draws on primary colors and bold patterns for that perfect child-like whimsy. Featured elements include everyone's favorite characters, street signs, banners, and subtle nods to favorite moments on the show, like a rubber ducky and a cookie. This kit also contains a fun capital alpha in 4 colors for learning your ABCs or titling your pages. Let your favorite photos and memories meet your favorite TV neighbors with Sunny Days! This kit is 50% off at Scraps N Pieces and My Memories for the week. Here is my layout for the Sunny Days kit. Strike a pose and smile! 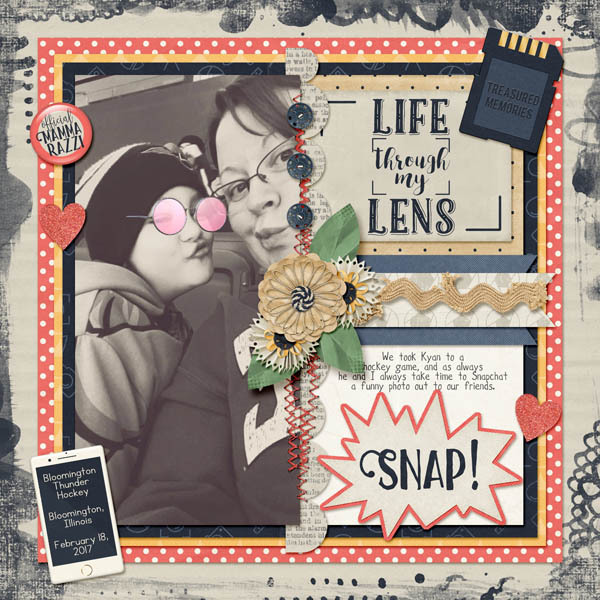 Picture Perfect by Magical Scraps Galore is a fabulous collection for us photo-snapping moms that love to capture everyday moments through our lenses. Packed with cute cameras and beautiful patterns, this fun and versatile kit is perfect to highlight your favorite shots, whether it's a fun selfie, a candid snapshot, or your most treasured photos. Find the full collection at 58% off -or the individual kit and add-ons at 30% off through Tuesday midnight at GingerScraps, Scraps N Pieces and The Digichick.